Before we sell you any car on the lot, the team at Malloy Ford like to take the time to get you familiar with the latest vehicles rolling off the assembly line. 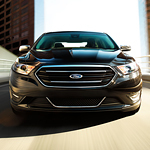 The new Ford Taurus is a popular full-size sedan that has a few features you'll appreciate. The Enhanced Active Park Assist system that comes in the new Ford Taurus was designed to locate a parking space and park too. Soon as the system alerts you a space was found, you'll get instructions when to accelerate, brake and shift, then your vehicle steers all by itself. When you put the new Ford Taurus into reverse, the Cross-Traffic Alert system is activated and will use radar technology to scan far in either direction for another vehicle that could move in your way. If a vehicle coming towards you is detected, one of your side mirrors will flash a warning so you know to slow and proceed more carefully until clear.